TYCO began celebrating America's 200th Anniversary with its first red-white-and-blue bicentennial offerings in the 1974-75 catalog. By 1976, TYCO had three diesel locomotives, a steam engine, passenger cars, freight cars, and a caboose available. The first diesel locomotive to be dressed in red-white-and-blue was the Century 430, given the product stock number 246. The paint scheme is based somewhat on that found on Seaboard Coast Line's GE U36B #1776. TYCO does refer in at least one catalog to this model as Spirit of '76 Seaboard Coast Line, making this the nearest thing to a prototypical offering among these famous model trains. The first Spirit of '76 C430 models included the verbage "Seal of the President of the United States" around the outer circle of the sticker logo on the unit's long hood. Later examples feature a simplified seal. There are at least three versions of the Century 430 in Spirit of '76 dress. The first, displayed in the 1973-74 catalog, features stripes up and over the roofline and a blue band wrapping around the nose of the unit. This first example includes on its long hood a seal reading "Seal of the President of the United States." The second example of TYCO's Spirit of '76 Century 430 includes the same paint scheme and differs only in its seal. The second variation's seal no longer includes any lettering wrapping around the seal's outer ring. The third TYCO Spirit of '76 Century 430 is the more common of the various offerings and features the same seal as the second example with a different paint scheme. This third red white and blue C430 has a solid blue roofline behind its cab and no longer has the blue band running around the nose and onto the cab sides. A new '76 sticker adorns the nose of the third variation C430 that is not found on earlier examples. The Alco Super 630 was dubbed The Super Spirit of '76 by TYCO and arrives in the 1975-76 catalog. Those lucky enough to have this loco mint-in-the-box, will note that the traditional TYCO brown-and-orange gives way to red-white-and-blue on the package. 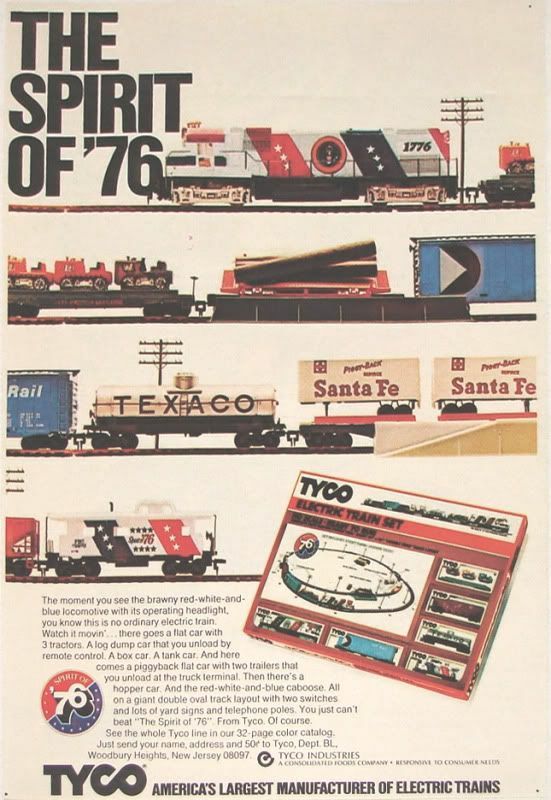 This was the last Spirit of '76 loco to remain in TYCO's catalogs. It is found as the only bicentennial offering in the 1977 catalog. Not content with its two Alco diesel dressed for bicentennial service, TYCO also made the F-9A available in Spirit of '76. The F-9 could be purchased as a single unit or in a twin pair in the popular '76 colors. To my knowledge TYCO products of this time should have all come from Hong Kong. At a swap meet, I found an F-9 in Spirit of '76 with "Made in Austria" on its fuel tank. Exact details behind this Austrian run of F-9's is not known. The bicentennial F-9 is also made from the mold that offers separate number boards. Notice the unit is #4015, which was the standard number given to the majority of TYCO F-units. Review my F-9 section for further information regarding the various shell variations utilized by TYCO for this model. The Spirit of '76 F-9s were available as Twin F-9 Diesels (No.248-35) in the 1975-76 catalog. That set provided a Powered and Non-Powered F-9 in '76 colors. The Spirit of '76 F-9 has also been seen accompanied by the '76 Caboose in a loco and caboose combination offering. JCPenney includes the set of twin F-9A units in their 1976 Christmas catalog. The Penney's stock number for the set was #X 926-1546 and they sold for $14.99 in 1976. TYCO didn't forget the steam fans when handing out Spirit of '76 paint jobs. This old-time steam engine was the only non-diesel locomotive to be offered in bicentennial dress. It was sold in a train set with three old-time passenger cars, as well as being available by itself. TYCO offered its 50' box car in a set of three bicentennial themed offerings. Collectors should note that in addition to the set consisting of three different cars, there are also three different versions of each. So, there is a total of nine ways you can own TYCO's bicentennial box cars. This set of box cars is included in JCPenney's 1976 Christmas catalog and was their stock number X 926-1629 A, selling for $5.99 that year. The Early Version of the Bicentennial Box Car is seen above. It was first found in the 1974-75 catalog. The scenes depicted on the three cars remains the same between each set, only the paint scheme changes. This set is No.362 and was sold for $2.50 per car, when introduced. The three cars return in the 1975-76 catalog with a different paint scheme. The cars in this set are: 362A-Minuteman; 362B-Washington; and 362C-Paul Revere. The cars pictured above are included one additional time in the 1976 catalog, then disappear from the TYCO line. There is another variation of this paint scheme, it features slightly shorter red stripes on the "Spirit of '76" logo. Seen below is an example of the "short stripes" version of the Washington's Crossing box car. TYCO offered its Old-Time Combine and Old-Time Coach Passenger Cars in a red-white-and-blue Spirit of '76 dress. These cars were part of TYCO's Spirit of America train set. They were also available individually during the mid-'70s. It seems to many that any and all red white and blue trains produced must be TYCO. TYCO does appear to be very much associated with the amazing number of bicentennial HO-scale trains made in the 1970s. However, TYCO was only one of many companies to dress models in patriotic colors. The likes of AHM, Athearn, Bachmann, Life-Like, Lionel-HO, Model Power and others all produced items with the 1776 theme. As a good rule to follow, TYCO nearly always had either "TYCO-MANTUA" or "TYCO" on the bottom of its products. For example the fuel tank bottom of a TYCO diesel should have "TYCO Hong Kong" on it in raised plastic letters. You may read more about the American Bicentennial at Wikipedia.org.